The Revolution Rope features dual-core bearings for great spin and performance. This rope is a serious advantage in any workout requiring speed and precision. The Cable Speed Rope is very similar to other speed ropes on the market except the extended handle is great for faster rope speed and better grip. 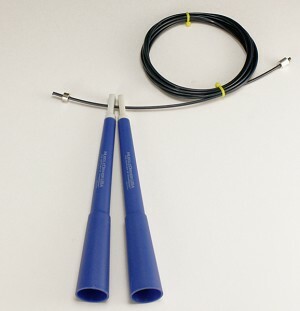 This Cable Speed Rope's handle is a bushing design that allows a smooth rotation on every jump. The handle is extended to 7 inches to provide a greater turning radius and increasing rope speed with little to no extra effort. The cable is 2.5mm steel wire with a nylon coating. The cable is 10ft and adjusts simply by cutting the cable to desired length.